A profile of Bell in The Nation that year reported that the Scot spoke with a "rattling burr that adds piquancy to whatever he says." 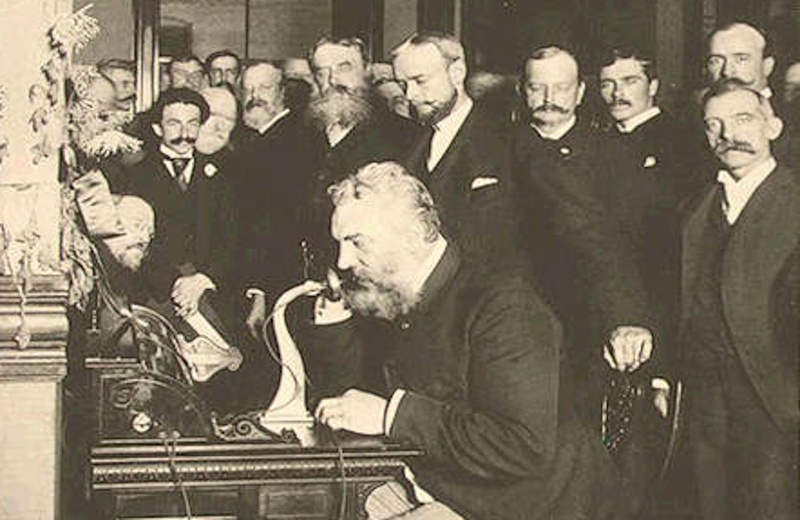 On this day in 1915, Alexander Graham Bell, the Scottish inventor who received a patent for the telephone in 1876, made the first transcontinental phone call. Later that year, in the issue dated October 7, 1915, The Nation profiled Bell for its regular series, “Notes from the Capital,” which, written by a pseudonymous writer named Tattler, examined prominent personalities in Washington. Dr. Bell is the typical Scotchman in appearance, speech, and manner. His broad face, framed in a mass of white hair which rises in a great shock above his brow and stands out around his jaws and chin like the unbroken mane of a lion, prepares you for the rattling burr that adds piquancy to whatever he says. He is a man whom you would describe as big rather than large, and the adjective applies to everything about him—his height, his shoulders, his hands, his carriage. I was going to add his voice, but that might convey a false impression: for, though his lungs are as leonine as his head, his long research in the field of vocal phenomena has cultivated in him a soft mode of speaking, with the most varied range of infexions and an enunciation which is as clear as the stroke of a crystal clock. You are not surprised, after conversing with him, to learn that he began his career as a teacher of elocution and music, and that his first ambition was to become a famous composer.